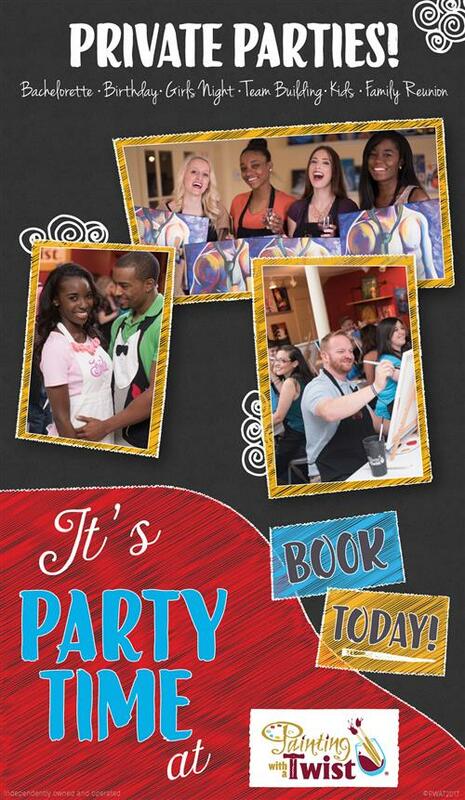 Hosts of parties with over 12 guest's receive a $35 gift certificate for a future class! We provide all of the art supplies, as well as cups, napkins, paper plates, and corkscrews. Studio A can accommodate a maximum of 40 painters for portrait painting's and 36 painters for landscape painting's. Studio B can accommodate a maximum of 18 guests. Team Building collages requires 9 or 16 painters. There is an additional set up fee. 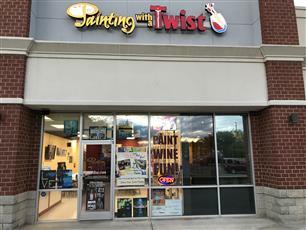 Just call us at 704-658-2386 or email your request to us at studio229@paintingwithatwist.com. How easy is it to reserve a private party? It's actually very simple, the first thing we will do is confirm that we have availability for your requested date and time. Once we have confirmed a date and time a representative from Paining With a Twist Mooresville will send you an Online E-Contract, this will confirm the agreed date's and times are correct, it will also inform you of the cancelation policy in the event something should arise. At the bottom of the contract there is a link that will ask for a deposit to hold the event, the price varies depending on the class but the deposit does go towards paintings for your event an is NOT an extra fee. Once the deposit has been paid we will send you link to our Online library and you will begin the process of selecting the painting you want to paint for your event. Once you have selected your painting we will send you an E-invitation link that you can email to anyone attending, it will show what they are painting, when they are painting and there will also be a link provided for them to register online prior to the start of your event. 90 minute kids painting parties in the Private Party room will require a $50 deposit which will go towards 2 paintings. 2 hour painting parties in the Private Party room will require a $70 deposit which will go towards 2 paintings. 3 hour painting parties in the Private Party room will require a $90 deposit which will go towards 2 paintings. Paint YOUR pet painting parties in the Private Party room will require a $110 deposit which will go towards 2 paintings. 90 minute kids painting parties in the Main event room will require a $100 deposit which will go towards 4 paintings. 2 hour painting parties in the Main event room will require a $140 deposit which will go towards 4 paintings. 3 hour painting parties in the Main event room will require a $180 deposit which will go towards 4 paintings. Paint YOUR pet painting parties in the Main event room will require a $220 deposit which will go towards 4 paintings. How many painters will I be required to have? -Sunday through Thursday and before 6pm on Friday and Saturday we have a 10 painter minimum for our Private Party room. -Friday and Saturday after 6pm there is a 12 painter minimum for our Private Event room. -Sunday through Thursday and before 6pm on Friday and Saturday we have a 20 painter minimum for our Main event room. -Friday and Saturday after 6pm there is a 30 painter minimum for our Main Event room. NOTE that if any part of your event ends on Friday or Saturday at any point on or after 6pm you will be required to meet the the 6pm and later minimums. In the event that the host falls short and fails to meet the minimum number of painters they will be liable for FINAL PAYMENT of minimum required painters BEFORE the class begins. Failure to meet final payment can result in termination of party. We no longer take payments after classes and ALL balances must be settled prior. 7 days of the week & you name the time (9am-11pm), subject to artist availability. Can I have an Offsite Party? -Yes we do, however we do not do them at a personal residence. All Offsite events have a 12 painter minimum Monday through Thursday. Friday through Sunday events have an 18 painter minimum. The event host will be responsible for Final Payment ensuring event minimums have been met. For all offsite events FULL payment must be paid 48 hours prior to the start of the event, unexpected painters will be added and paid for as needed during the event. We do not host offsite fundraising events. While we will make every effort to ensure no paint can be spilled, Host must sign a Hold Harmless Agreement in the event any damage does occur during your event. These events are great for Team Building and Church get gatherings just to name a few. Offsite fee's are as follows, within 5 miles of the studio there is a 1 time $29 fee, 5-12 miles there is a 1 time $49 fee, 12-30 miles there is 1 time $99 fee. Further than 30 miles please call. How Do I Pay For My Party? and what's the Cancellation Policy? The party spokesperson/host will reserve the desired day & time with a nonrefundable $70 deposit on a credit card and private party agreement. Guests must pay in advance and may make arrangements to pay online or by phone. There is a 14 day cancellation notice. If less than a 14 day notice of cancellation is given, a $150 penalty will be charged to the hostess. Cancellations within 7 days of party will incur a $350 penalty. Hostess is responsible for the minimum payment due for the party within 48 hours of start of party regardless of number of reservations or attendance. Host a unique party for your child's birthday, Scout Troop, sports team, or dance class! Kids love painting here and they also love our dance breaks! Plus, kids leave with their complete masterpieces, so there is no need to come back and pick them up at a later date. Kid parties are available any day or evening of the week, except Friday & Saturday nights. Typical Kids Parties include 1.5 or 2 hour art with time for breaks, cupcakes/cakes and presents. These Packages exclude Friday and Saturday Evening after 6pm. Minimum requirements are higher. Please inquire to see availability. We are experts in creating a FUN and Exciting office escape. Sometimes work can get overwhelming and stressful, join us for a few hours with a chance to let loose, have fun and BOND again. You can cater a lunch or just show up and paint. -Team Building events does require 10 painters Sunday through Thursday and 12 Painters on Friday or Saturday. - Your team can select the painting for your event. - Create your own CUSTOM painting for this event, 45 days planning is required and additional charges do apply. - Create a collage for your office, everyone paints a small portion to create one large painting. Please call to learn more, it requires a certain number of painters and additional charges do apply. Please call 704-658-2386 or email studio229@paintingwithatwist.com for availability. I am happy to walk you through the process to make your party planning a breeze!